Greetings from West Kensington & Gibbs Green Estates! 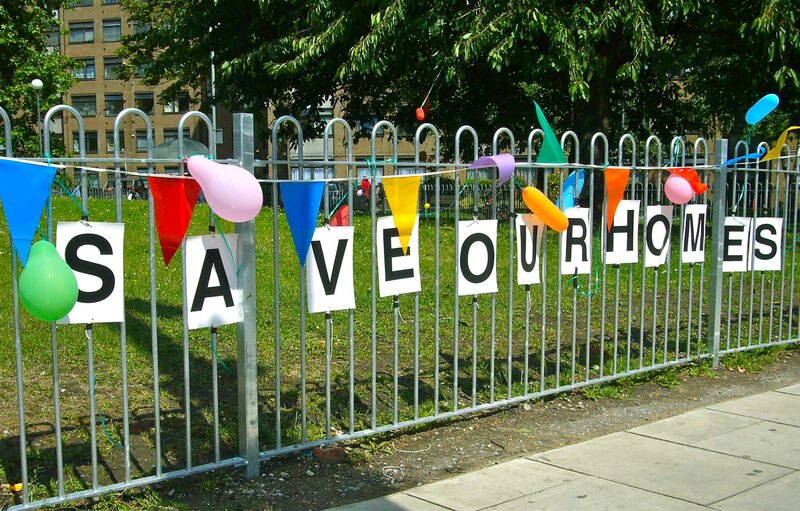 We have been campaigning since 2009 to save our homes from being demolished to make way for thousands of luxury flats. The Council made a deal with developer Capco to destroy our estates, the Lillie Bidge Depot, which is the main engineering facility for the London Underground, and the Earl’s Court Exhibition Centres. This monstrous £12 billion scheme would replace a much used and loved piece of London with 7,500 flats. 80% of these would be sold at market prices with one bed flats starting at £600,000. 10% of the new homes would replace the estates. A further 10% will be so-called affordable housing. The number of ‘affordable’ homes is woefully inadequate and they won’t be affordable because the flats would be sold or let at 65% of market value. In this area, one bedroom flats sell for more than half a million pounds. Check our Photos page for the latest pictures of us and our homes. You can find our latest newsletters and other documents on our Newsletters and Info page. Our Media Coverage page has links to the latest articles about the estates and our campaign. You can follow us on Twitter @WestKenGibbsGr and Like our Facebook page West Ken & Gibbs Green – The People’s Estates. West Kensington and Gibbs Green are two adjacent estates in West Kensington, W14, London Borough of Hammersmith & Fulham. The estates contain 760 homes and close to 2,000 residents. 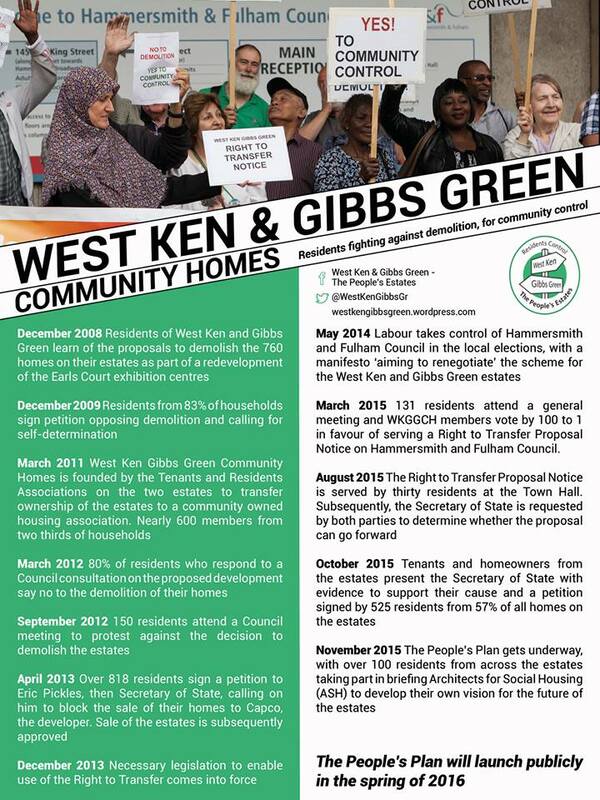 Over 600 residents from two thirds of households are members of West Ken & Gibbs Green Community Homes Limited (WKGGCH), the company set up by residents to take over the ownership of their estates. The Members have elected a Board which is made up of 14 residents and 4 housing experts. The Board meets every couple of months to progress its founding aim, which is to improve the neighbourhood and save the estates by transferring them into community ownership under resident control. 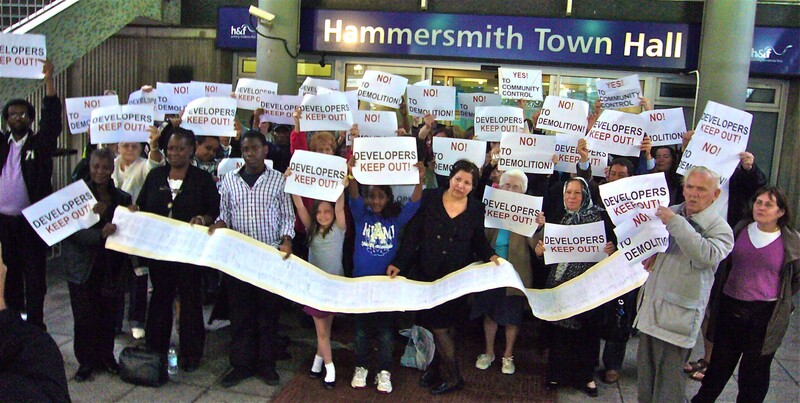 On 8 December 2009, the West Kensington & Gibbs Green Tenants & Residents Associations served a S34A Notice on the Chief Executive of Hammersmith & Fulham Council proposing their estates be transferred to a resident-control community housing association. However, this could not be taken forward since the Regulations had not been made. In January 2010, residents wrote to the then Secretary of State inviting him to make the regulations needed for him to have the power under S34A to require local authorities to cooperate with transfer requests. In December 2013, after years of lobbying, the Coalition Government implemented the Right to Transfer by making the Regulations and publishing the Guidance. We oppose the schemes for West Kensington and Gibbs Green. We aim to renegotiate these and halt the use of Council powers such as Compulsory Purchase Orders on any of them. … take immediate measures to protect council homes now and in the future. We will work with council housing residents to give them ownership of the land their homes are on. In July 2014 120 residents attended a general meeting and voted to serve the Right to Transfer Notice on the Council. Another general meeting held in March 2015 was attended by 131 residents. Again they voted to serve the Notice. The Council has been holding talks with developer Capco to review the redevelopment plans. But residents have been excluded from these talks. At the request of Councillors we held back from serving the Notice. Eventually, having no confidence that resultant proposals would save the estates, West Ken Gibbs Green Community Homes finally served the Right to Transfer Proposal Notice on the Council on 11 August 2015. Support other communities that wish to take charge of their neighbourhoods through legislative mechanisms using this model. Implementation of The People’s Plan, which would keep the existing 760 homes on the estates, provide 250 new homes in the form of infill and additional storeys to existing blocks. The sale of 180 of these homes will help to subsidise 70 new homes for social rent to ease overcrowding and allow older residents to downsize locally. It will also help to pay for improvements to the existing council properties. A copy of The People’s Plan, which has been sent to all households on both estates for consultation, is attached. Community services and events for residents with many more activities for younger people. WKGGCH has received grants from The Esmee Fairbairn Foundation to empower residents to explore the implementation of Section 34A of the 1985 Housing Act, its implications and learning for the wider sector. We are currently funded by the Nationwide Foundation to develop the People’s Plan for improvements and additional homes as part of our ambition to transfer the estates to a community owned resident controlled housing association. To get in touch with us, please contact West Ken Gibbs Green Community Organiser Jonathan Rosenberg by email at jlnr49@gmail.com or on his mobile at 07961 301 801. West Kensington Estate TRA, Gibbs Green & Dieppe Close TRA, and West Ken Gibbs Green Community Homes Limited (WKGGCH) are made up of Committee and Board Members elected by residents at the AGMs. The TRAs were re-established in 2009 and WKGGCH was founded by the two TRAs in 2011. All three organisations have been working to save the estates from demolition and redevelopment as part of Capco’s Earl’s Court scheme. Each organisation held its most recent Annual General Meeting (AGM) on Tuesday 4th October 2016. Every household living in the West Kensington Estate, the Gibbs Green estate and Dieppe Close was invited to attend the AGM for WKGGCH as well as the AGM for the relevant TRA. Overall, the meetings were attended by 78 residents from across both estates. The resident representatives for all three organisations were publicly elected at the meetings. The West Kensington TRA AGM and the WKGGCH AGM was witnessed by local ward councillor Daryl Brown and local MP Andy Slaughter. West Ken Gibbs Green Community Homes is a membership organisation with over 581 members from 64% of households on the West Kensington and Gibbs Green estates. In 2009, residents from 83% of households signed a petition saying no to demolition and demanding that residents have a say in the future of their homes. In 2011, residents from two thirds of households on the estates joined WKGGCH which is dedicated to improving the neighbourhood and saving the estates by transferring them into community ownership under resident control. In 2012 residents responded to the Council’s consultation on the redevelopment proposals by four to one against demolition. In 2013 residents from 60% of households signed a petition to the Secretary of State requesting that he refuse consent for the sale of the estates to Capco’s EC Properties LP undertaking. In 2014 120 residents attended a General Meeting at which members voted unanimously that WKGGCH should serve a Right to Transfer Proposal Notice on the Council. In 2015 residents from 57% of households signed a petition to the Secretary of State requesting that he support the aforementioned Right to Transfer Proposal progressing to the next stage. Over one hundred residents subsequently took part in workshops and estate tours to brief architects to produce The People’s Plan: a costed alternative to demolition which proposes improvements to the West Kensington and Gibbs Green estates; new homes as infill and additional storeys to existing buildings without demolition.